Did you know that coconut oil has earned its reputation as the world's only natural, low-calorie fat? If you pick a few brands of coconut oil and calculate their energy value (calories) contained in one gram of fat, you would've gotten a range of 9 kcal give or take few percent. This has pretty much the same calorie per gram (i.e. 9 kcal/g) as animal fats and other vegetable oils. In fact, coconut oil carries fewer calories because it contains medium-chain fatty acids that are smaller in size than the fatty acids in animal fats and other vegetable oils. For example, MCT (medium-chain triglyceride) oil has an effective energy value of 6.8 kcal/g. It carries only caprylic and capric acids – the 2 medium-chain fatty acids that are also found in coconut oil. But because coconut oil also contains the relatively longer medium-chain lauric acid and other long-chain fatty acids such as myristic, palmitic and oleic acids etc (these fatty acids have energy values ranging from approx. 8 to 9.4 kcal/g), the overall actual energy value of coconut oil becomes roughly 8.6 kcal/g. That's just a few percent lower than the actual energy values in animal fats and other vegetable oils. Which I think is the reason why coconut oil manufacturers simplify the caloric calculation by rounding it up to 9 kcal/g. This makes coconut oil appear as having somewhat similar energy value as those in animal fats and other vegetable oils. Apparently, such a small discrepancy in energy value is not significant enough for coconut oil to get its low-calorie reputation as a fat. It actually attributes to coconut oil's inherent fat-burning characteristic that makes it well-known as a low-calorie fat. 3 long-chain fatty acids (LCFAs) joining together via a glycerol molecule form a long-chain triglyceride (LCT). What your body does upon ingesting olive oil is that it'll first break down the LCTs in the oil into smaller individual fatty acids (LCFAs) in your small intestine. It then absorbs the LCFAs through the intestinal wall, and from there, reassembles them into LCTs again and package them together with phospholipids, cholesterol and proteins into chylomicrons. If your body does not use the LCFAs in the bloodstream immediately to fuel your metabolic and physical activities because it still has sufficient carbohydrates (derived from food) on tap, the LCFAs will eventually end up in your fat cells. Our body uses carbohydrate (carb) as the primary energy source and LCFA as secondary energy source. That's because carb converts to energy very much faster than LCFA. So, when there is sufficient carb, LCFA will normally be shoved into reserves. Unless you raise your physical activity to the point where your body needs to burn more calories to fuel the activity, your body fat remains "untouchable". In other words, the fat you eat is literally the fat you wear, even if the fat you consume comes from the health-promoting olive oil. But when you eat coconut oil instead of olive oil, you'll dramatically reduce your fat deposition because our body metabolizes the fats in coconut oil very differently. Unlike olive oil (and most other dietary oils, as well as animal fats) that composes entirely of LCFAs, coconut oil contains about 50–64% medium-chain fatty acids (MCFAs), which are smaller in size. Coconut oil also contains less than 1% of short-chain fatty acids, which are even smaller in size. But due to their insignificant contribution to weight loss, we'll focus mainly on medium-chain fatty acids. Because of their smaller size that facilitates quick digestion, our body prefers to use them as immediate energy source, just as it does to carb. Our body shuttles them directly to the liver for energy production and to cells for fueling metabolic activities after they're broken down from medium-chain triglycerides (MCTs) in our small intestine, rather than packing them away as body fat reserves like LCFAs. That means, MCFAs do not practically contribute to fat gain and cause weight gain as a result. Assuming the same 500 kcal daily fat intake but this time around coming entirely from coconut oil. Now, you have 50–64% less calorie stashed in your fat stores. That means, you cut your fat gain by 250–320 kcal (50-64%) up front. That's a massive reduction of effective daily calorie intake. Isn't that amazing? That's not all. According to numerous studies and researches, MCFA encourages the burning of LCFA too. So chances are, before the remaining LCFAs (about 35%) from coconut oil land in your fat stores through the bloodstream, they could have already been utilized and burned off as fuel too, leaving even lesser contribution to your body fat. Dr. Julian Whitaker, a well-known authority on nutrition and health says, "LCTs are like heavy wet logs that you put on a small campfire. Keep adding the logs, and soon you have more logs than fire. MCTs are like rolled-up newspaper soaked in gasoline. They not only burn brightly, but will burn up the wet logs as well" (Murray, 1996). LCT (long-chain triglyceride) is made up of various types and sizes of LCFAs. Animal fats and most vegetable oils contain 99% or 100% LCTs. MCT generally refers to oil that contains entirely of MCFAs. All dietary fats induce appetite-suppressing hormones. That explains why you feel more easily satisfied with fat added to your diet. As dietary fat also delays the emptying of stomach, you get to forestall hunger longer. In addition to these "special features" that all dietary fats possess, MCFA creates a more satisfying experience and thus, makes you feel full even longer than any other dietary fats. In a group of women, some were fed MCT drink while the rest LCT drink. 30 minutes after the drink they were allowed to choose and eat as much as they wanted for their lunch. Those who had the MCT drink before the meal ate lesser than those who took the LCT drink. If you're not convinced, another study involving a group of normal-weight men shows the same result. Men who took breakfast that contains MCT ate less at lunch. What's even more encouraging is that these men who ate less at lunch did not make up for the lower calorie intake at lunch by eating more at dinner. Why? That's because MCTs or MCFAs in coconut oil can enter cells with absolute ease to supply quick energy. When these cells feel satisfied, your body will respond by slowing down the absorption of sugar into your bloodstream (i.e. stabilizing your blood glucose levels). This enables a steadier and longer supply of energy to fuel your cells and keep you satisfied longer. When your blood glucose levels stabilize and you feel full longer, you won't crave sugar and feel hungry easily. These could also help to control your binge eating, resulting in overall lower calorie intake. So that's how coconut oil earns its reputation as a "low-calorie fat". Now, you know how coconut oil helps you consume less calorie without you having to force it on purpose. Let's move on to see how coconut oil boosts your metabolism at the same time for a more complete and effective weight loss. Bustling cells rev up metabolism. Any food you eat can raise cellular activity. But no food can boost your metabolism to the level where your body can burn fat all day long like coconut oil. Here's why. Carbs and LCFAs from food generally take only one path (by traveling through the bloodstream) to energize our cells and hike cellular activity. But MCFAs in coconut oil use two approaches to accomplish the same mission. How so? You'll feel the burning sensation somewhere near your stomach and below your chest when MCFAs are burned in the liver as fuel and heat is produced (thermogenesis). The feeling is particularly more apparent in cooler environment and of course, when you consume more coconut oil. Energy conversion (burning of MCFAs) in the liver produces heat (thermogenic effect), which in turn excites the entire body cells. Cells that are closer to liver get more heat energy. Just like when you heat up water its molecules move rapidly. And molecules that are closer to the fire move faster. At the same time, MCFAs in bloodstream also enter directly into other cells of our body to give an extra energizing boost to our metabolism. When cellular activity increases, your cells naturally demand more energy to stay at that level. MCFAs alone can't sustain for long. In view of that, your body will obtain energy from carbs and LCFAs via the food you consume. It'll draw on energy from your fat stores as well, resulting in body fat burning. This chain reaction will continue as long as you keep your MCFA supply incessant. Just one meal alone can activate your metabolism and keep it elevated for several hours. Of course, depending on the amount of coconut oil you eat with that meal. Imagine you include coconut oil in every meal you eat, you're literally setting your body to a full-day fat-burning mode, even while you're sleeping like a bear. You can consume as much coconut oil in the daytime as possible to induce fat-burning. But take it in moderation at dinner. This is because the thermogenic effect from coconut oil might work against the body temperature-lowering mechanism that helps to prep you for sleep. This unique way of handling MCFAs by our body makes coconut oil a perfect metabolism booster for those who need to lift up their metabolism for weight loss. Regardless of whether their sluggish metabolism is caused by low thyroid problem, genetic issue, diabetes, age, fatigue or something else. I've had people asking me whether they can simply massage coconut oil into their skin and get the same fat-burning effect as eating the oil. Well, I did come across people who rub coconut oil on their belly get 1-2 inches off after many weeks of sheer topical application. But not all get the same result. Some reported the exact same waistline before and after the rub. But almost all experienced the same thing – their belly skin felt a lot smoother and softer than before. That's because coconut oil speeds up the removal of dead cells on the surface of our skin, allowing new cells to quickly take their place. It also helps to hold water in the skin. So when you applying coconut oil to your skin, coconut oil actually benefits your skin more than it does for weight loss. For those who do really get some inches off their waistline, I think the act of massaging itself is more likely the "culprit" that helps to "scrape" some inches off as massage might break down the fibrous tissue that holds the fat in place, dispersing (not burning) the fat as a result. Additionally, repetitive massaging encourages your lymph glands to flush out excess fluid, which might also have a slimming effect on your belly. Having said that, don't be surprised to rub off some belly inches even when you use other oils or just normal cream on your skin instead of coconut oil. It's essentially the act of massaging that works. You might argue that the MCFAs in coconut oil can enter our body via the skin and offer the same weight loss benefits as eating it. I don't deny that fact. But there's only that much coconut oil your skin can absorb. And that's definitely not enough to boost the metabolism of all your cells to achieve the same level of fat-burning effect as ingesting the oil. Actually, if you want to use coconut oil for weight loss, why not just eat it? It's so much easier and convenient that way! Most important of all, consuming the oil definitely works to help you lose weight more effectively since you can eat more of it to raise its fat-burning effect on your body fat. Already tested and proven by many overweight people! Yes, choose virgin coconut oil (best, organic) because this type of coconut oil contains the best combination of various MCFAs for boosting metabolism and toughening immunity. It benefits both weight loss and health. Supply quick energy to fuel high-intensity workouts. Flavorless and odorless. May trigger diarrhea, like virgin coconut oil. Recommended to start off with just one teaspoon per day first. This is because MCT oil carries purely caprylic and capric acids, which are very short medium-chain fatty acids (usually extracted from coconut or palm kernel) that can infiltrate into your cells easily and then convert to energy quickly, thus providing an immediate boost to your metabolism. For that reason, some people take only MCT oil for weight loss. As an advocate for healthy weight loss, I hope you can lose weight and gain health at the same time. Hence, I encourage making virgin coconut oil as the staple in your weight loss diet and MCT oil a supplementary for weight loss. This is because eating virgin coconut oil really offers plenty of health benefits besides its fat-burning property. MCT oil can never match up to the health benefits of virgin coconut oil. Another thing is, if you find the distinctive natural coconut scent in virgin coconut oil a bit too strong for your liking, either you learn to like it or you mix and match MCT oil with virgin coconut oil until you get the perfect odor to your preference, without sacrificing too much of the health benefits from virgin coconut oil. No matter how many extra pounds you wish to shed, whether 20, 50 or even 100 pounds, don't consume too much coconut oil in one go. True, the more coconut oil you eat, the more fat you can burn. But because coconut oil may loosen bowels and trigger diarrhea, it's best to start with 1 or 2 teaspoons daily for a few days first. This allows your body to adjust itself to the oil and prevent diarrhea-like symptoms from occurring before your next increment. More and more people are relieving their constipation with coconut oil. From this, you can imagine how strong its bowel-stimulating effect is. You can consume coconut oil on its own if you don't mind its greasy feel in your mouth (I found eating this way a bit disgusting. But when added to my food and beverages – Yummy!). However, based on my own experience as well as feedback from people whom I recommended the oil to, eating the oil on its own produces more potent bowel-loosening effect than mixing it with food. That's why I always suggest people to cook their food with it (substitute coconut oil for whatever cooking oil you're using now), or add it raw to their food or beverages (juices, smoothies etc). Doing so enhances the flavor of your food and drinks too. 4.4 When will coconut oil start burning fat? Don't expect the weight loss benefits of coconut oil to manifest after eating it for only a few days or so. The toxic buildups in your body over the past years due to animal meat and junk food consumption can hamper the releasing of fats from your tissues for burning. As coconut oil has potent detoxifying properties, it'll deal with your toxins first before it can draw on the fats from your fat reserves and use them as fuel at its disposal. Therefore, it takes regular (i.e. every day for best result) consumption for at least 2 to 3 weeks before you can notice the difference on your bathroom scale. Of course, if you manage to detox well with coconut oil, the scale should show a dramatic drop of few pounds in a week. But that's only "weight loss" due to the removal of waste in your gut that may weigh several pounds and not fat loss yet. True weight loss is burning off of excess fat that results in weight loss. So, please take note of this. 4.5 How much coconut oil for weight loss? No restrictions on how much coconut oil you should take for weight loss. That depends on how well your body can adapt to the oil's effect. If your body can only take up to 2 Tbsps daily after several weeks of gradual addition of coconut oil to your diet, so be it. But generally, most people can take up to 3 or 4 Tbsps every day, which are what I would recommend for weight loss. Make sure you cut back on the calorie intake of other food while increasing your doses of coconut oil. That's because excess calorie when not used as fuel will still convert to body fat. For example, instead of a bowl of oatmeal every morning, trim the portion by ¼ upon adding coconut oil initially. Cut it down by half straight when you mix more oil into the food. This ensures you won't pile up extra calories on your plate but yet still able to feel full longer. One study shows that after consuming a meal containing medium-chain fats, normal-weight people increase their energy expenditure by 48%, but obese individuals increase their energy expenditure by an amazing 65%. In other words, the more excess body fat you have, the stronger will be the burning of body fat by coconut oil. That means, you may come to the point where coconut oil starts burning lesser body fat even though your metabolism remains optimally elevated. That's good news because that shows you're getting closer to a normal BMI. Don't limit yourself to just eating coconut oil. You can also include coconut meat, and coconut cream or milk in your diet. Best non-dairy buttery flavored coconut oil I've ever tried. Delicious spread on bread that makes your breakfast more fulfilling. Stored in glass jar. These coconut products are good sources of MCFA too. Adding them to your equation of coconut oil diet can help keep your metabolism active at all times. We're talking about long-term weight management, not short-term weight loss. If you treat coconut oil as a temporary weight loss solution, you're likely to fail on your quest to get down in shape and stay slim for good. That said, don't stop your coconut oil intake even after you've achieved your desired shape and size. Keep it on. Hi Daisy, rubbing coconut oil on your belly may most likely not make it disappear. But eating coconut oil does. And it has to couple with exercises if you want to boost the fat-burning effect of coconut oil. On top of that, control your diet intake so you don't eat more than what you need. Hi Peggy, you're right that coconut oil makes food taste sweet though it does not contain sugar. Coconut oil helps to enhance flavor. As coconut oil is very versatile, you can add it to literally any recipes you want. For example, a smoothie recipe – all you have to do is pour some coconut oil over it and you're ready to enjoy the healthful smoothie with extra health-boosting power from the tropical oil. If you're making cold desserts like sorbet, that's even better with coconut oil since it hardens below 76 °F (24 °C). Bear in mind that when eating your food with coconut oil for weight loss, keep your satiety level at 70% or less so you don't take in more calories than your body requires. Hi so reading your comments. Rubbing it on will not help but eating it will lose belly fat or drop pounds. But do I put coconut oil in everything I eat? And how coconut oil do I put in my food? Yes Chasity, you should try putting coconut oil in everything you eat. You can put as much as you deem fine and eat as much as your body can take it. I suggest starting off with 1 or 2 teaspoons per day first. Build your momentum from there and increase your intake gradually over few weeks to minimize side effects of eating coconut oil. I'm going to try this.Hopefully it will help me with constipation as well as lose tummy fat. Hi Chanelle, sounds that your bowels are not moving well. If that's the case, you must first understand that the wastes that got stuck in your colon or other parts of intestines can contribute to as much as 10 pounds. That means if coconut oil does help clear your bowels, you could immediately lose a few pounds or even as much as 10 pounds in just couple of days. And don't be too happy about that because that's just the after-effect of detoxification, and does not mean that you've burned off 10 pounds of excess body fat. Also, along with the bowel-loosening effect will be loss of water as well. So, you could be losing water mass also. Which means, if coconut oil moves your bowels and helps you detox well, you could have lost up to a few kilos in just a week. That's the short-term effect and it's really ONLY weight loss and not fat loss yet. For long-term fat loss and weight maintenance, you should keep adding coconut oil to your diet. At the same time, learn to take more fiber-rich whole foods like vegetables (best would be dark green leafy types) and fruits. And remember to drink adequate amount of water to help with the detox. Otherwise, the weight loss effect of coconut oil will not max up and you could end up like some people whining that coconut oil can't help lose weight. If you do not detox well, the toxins from the wastes (in your gut) can impair your cellular metabolism, making it difficult for your body to utilize body fat for energy conversion. Which is why when using coconut oil for weight loss, people with constipation problem will take longer to see true fat loss since coconut oil needs to perform detox first before your body can effectively pull out fats from reserves to burn them off. 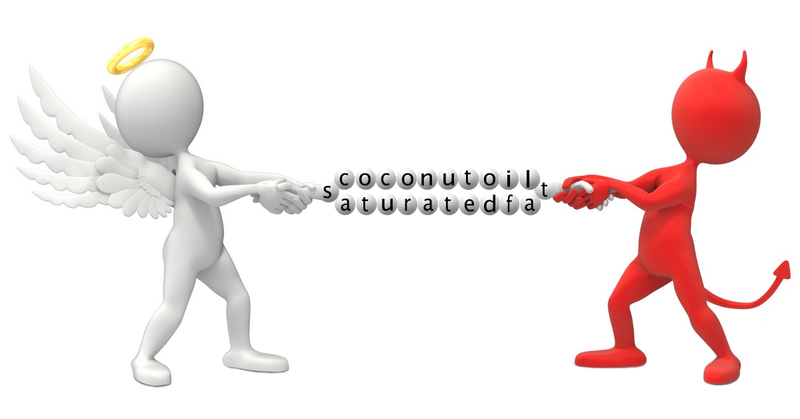 Can you ingest pure fractionated liquid coconut oil?? I use it as a carrier for my essential oils, but wonder if it is o.k..for anything else? Hi Jennifer, if you want to try losing weight with coconut oil, it's best to use virgin coconut oil or MCT oil. MCT oil is a type of fractionated coconut oil that's made for consumption. Most that are labeled as Fractionated Coconut Oil are usually made for skin care and not meant for consumption. I do not know which brand of fractionated (liquid) coconut oil you're using so I cannot advise you on that. Can you tell me the brand and provide some details on the oil so I can check for you? Where do I find the coconut oil you recommend o used nature's basket. Organic Unrefined extra Virgin Coconut Oil. Hi Barbara, which nature's basket are you referring to? I don't quite get you, sorry. Anyway, you can buy the organic virgin coconut oil I use on Amazon. If you're not comfortable with Amazon, iHerb is another good place that I get some of my health products from. One thing though, iHerb's Nutiva Organic Virgin Coconut Oil may cost a few bucks more than that in Amazon because of their heavy-duty packaging to ensure the goods are in good condition when it reaches their customers' hands, which I feel it's well worth buying from. I use 1to2 Tab spoons of Coconut Oil (not solid) in 2cups of coffee with 1 Tab of Real Butter and put it in a shake mixer and drink it everyday if helps me which oil is the best for this? Hi Carolyn, real butter contains less than 10% of both short-chain fatty acids (SCFAs) and medium-chain fatty acids (MCFAs) whereas coconut oil contains 50–64% of MCFAs and less than 1% of SCFAs. I would say coconut oil benefits you more than butter since butter carries a lot more long-chain fatty acids that could have negative effect on weight management. hi soon chai.. am happy to read you blog about coconut oil for weight loss and i guess it would work well for me.. and I would like to ask you one thing.. will the coconut oil helps in reducing breast size ?? or can you suggest other natural home remedies for reducing the size..
Hello Radha, sorry to keep you waiting, just returned from Vietnam. When coconut oil burns fat, it cannot choose which to burn or which not to. It depends on how your body utilizes stored fat and decides which part of fat to let go first. But in most cases of losing weight with coconut oil, the breast size will reduce along with fat reduction in other parts of body. It would be funny to lose just the breast size while keeping the fats in your waist, buttocks, thighs and arms intact. There's no natural remedy to reduce just the breast size, don't fall into those tricks and don't spend a dime on that. The only thing you can do is (in my opinion), do some chest-stretching exercises because when you try to work out a particular part of your body, you would notice that that particular part is unlikely to store fat. Just go to Youtube and source for some safe yet effective chest workout routine. Hi Radha, coconut oil provides natural weight loss and natural weight loss takes time. Also, it depends on how much fat you need to burn. Of course, the more excess fat you have, the longer you would need to take coconut oil. However, I suggest that you change your perspective on coconut oil and don't treat it like a weight loss tool. Because you won't stick to it for long when it fails to give you quick result. Treat coconut oil as a food. Add it to every meal of yours. In general, 3–4 tablespoons per day is good enough to reverse your sluggish metabolism. But if you can go beyond that amount that would be even better. Check out How much coconut oil for weight loss? for more details. When you treat coconut oil as any food you're taking, it would become a staple in your diet. This makes losing weight easier for you. Also, coconut oil is good for health besides weight loss. Hence, you should continue taking it even when you have gotten your desired size. Dear Soon, thank you for the best explanation of the benefits to using coconut oil that I have read. I have been adding a tbsp of virgin coconut oil to my breakfast coffee which is tasty and seems to give me a boost in the morning. I will take your advice and include a tablespoon of virgin coconut oil with each meal. i gave birth 4 months ago and breastfeeding is going on.. is it okay to have virgin coconut oil in my daily intake? is it safe for the baby? but now im using the coconut oil as my after bath oil all over my body..thank you. Hi Tracy, virgin coconut oil contains good amount of lauric acid and capric acid that are also present in human breast milk. When you consume virgin coconut oil, your breast milk will increase in lauric acid and capric acid, plus other germ-fighting compounds that will then pass on to your baby through breastfeeding. Also, because taking virgin coconut oil can kick your metabolism into high gear, your nutrient absorption power will rise too. That means you'll be able to produce high quality breast milk for your baby. And when your baby receives that, he or she will be able to absorb nutrients fast from the food and be well protected against harmful viruses, bacteria and other germs. But please do not rush and start off with 2 tablespoons in one go as virgin coconut oil can stimulate your bowel movement. Start with just one tablespoon per day spreading over your meals, and from there slowly increase your intake until you're good with taking 3 or more tablespoons daily. Please check out Side effects of coconut oil to better understand the use of coconut oil and how your body might react to it. Hi Soon Chai, I just came across your website and the information is very helpful. Thank you for all your research. I have a question about the different methods for eating the virgin coconut oil. Does the coconut oil lose some of its effect when it is heated? Does it lose some of its effect if heated above a certain degree? For example, when adding to coffee or tea. Does the coconut oils effect lessen when added to very hot beverages or meals? Hi Aisha, adding to steaming hot coffee or tea does lessen coconut oil's effect because some phytonutrients in coconut oil will evaporate with the steam, albeit slowly. That means, only a very small degree of the oil's effect will be lost because the temperature of the tea or coffee would be less than 212 °F (100 °C), which is way below the damaging smoke point of coconut oil at 350 °F (177 °C). Hi Aisha, virgin coconut oil breaks down at above 350 °F (177 °C). Meaning, it will lose its health and weight loss effects completely under prolonged exposure to such high temperature. But if you're talking about temperatures way below that, virgin coconut oil may just lose some of its phytonutrients. Not much, really. Does coconut oil work to eliminate strech marks? Hi Nereida, your skin will tighten on its own to eliminate the stretch marks. But how long it will take depends on how "stretchy" your skin has become post weight loss and how much skin-nourishing fruits and vegetables you're consuming. Coconut oil works to expedite the skin healing process since it helps to boost cellular metabolism. Hello Soon Chai. Thank you for all this wonderful information. I recently read where a coconut oil detox could be done by swishing a Tbsp of coconut oil around inside your mouth and spitting out so all the toxins the oil pulled out would be eliminated. Is this even possible? If so, and I was to add coconut oil to my diet, would that help with weight loss and just helping my body to become healthier? Supposedly coconut oil helps rid the bowels of candida, are there foods I should abstain from eating so as to not counter act it's benefits? One thing though, I have always almost immediately vomited upon smelling coconut. I am afraid to open my new bottle. People have always told me coconut milk doesn't smell like the smell generally associated with say suntan oils. The ingredients listed are : LCO MCT 100 (Liquid Coconut Oil MCT), contains tree nuts. Hi Cindi, it's true that pulling with coconut oil can help cleanse your mouth of germs (and toxins). It also keeps your gum healthy as well as prevents harmful germs from entering your body. Thanks to the antimicrobial medium-chain fatty acids in the oil. I do oil-pulling quite regularly and I feel it's so much better than using antiseptic mouthwash. Oil pulling does not help in weight loss, but eating coconut oil... yes. This is because the same medium-chain fatty acids in the oil will help accelerate your metabolism for fat-burning, besides fighting germs to help boost your immunity. Candida is a genus of yeast that feeds on sugar. Watch your sugar and carb intake. Also, toxins from meat can weaken your immunity that indirectly promote Candida growth. That said, cut back on your meat consumption as well. I mean, improve your diet gradually, like over the course of several weeks (or even months) rather than trying to eliminate the bad stuff quickly because doing so often triggers "withdrawal symptoms" that could easily fall you back onto your old eating habit or make you become worse than before. Gradual changes are more sustainable and longer-lasting. Virgin coconut oil does smell of coconut. Of course, some brands are milder while others are stronger. You can try Nutiva refined coconut oil, which holds almost what a virgin coconut oil carries, but without the coconut smell. Or do you just have to massage your stomach with coconut oil? Hi Anita, you're trying to lose your stomach fat, right? Massaging may help to a small extent only. Eating coconut oil is more effective in burning stomach fat. The more you eat, the more fat you'll burn. But please scroll up and read this article carefully on how best to eat coconut oil for weight loss. Hello I just started taking Coconut oil organic unrefined for two weeks now just one teaspoon in my tea in the morning and it's giving me horrible headache I don't want to stop taking it though what should I do? Hi Sonia, taking just one teaspoon of unrefined coconut oil in the morning together with your tea can hardly effect headache, let alone horrible headache on you. Are you sure the headache is caused by unrefined coconut oil? Poor sleep quality, stress, depression, overuse of pain medication, too much processed meat that contain nitrates, low-carb diet etc can trigger headache. When headache kicks in, please look back on your diet and lifestyle. Rarely, coconut oil has anything to do with headache unless you're taking a lot in the beginning that triggers intense detox reaction or elimination of Candida yeast. Hello...is it ok to still take apple cider vinegar before bed if consuming coconut oil in the mornings? Hi Annette, there's no conflict between coconut oil and apple cider vinegar. I often have apple cider vinegar as a dip for coconut-oil-cooked food, meaning, I often ingest both together during meals. However, you must exercise precautions when taking apple cider vinegar before bed. As long as it doesn't affect your sleep, you're good to go. Awesome!! Thanks for the great information!! I've been using coconut oil from 2-3 weeks now. I'm taking a table spoon in the morning but to be honest, I noticed lately I gained some weight, even if my diet routine didn't change, I still workout as I did before. It makes no sense to me, since coconut oil is promoted as a metabolism enhancer. I think I will stop taking it since I don't see any other improvement. Hi Mihaela, please go to section 4.7 on the burning effect of coconut oil on a person's body. Best would be to read everything from the beginning of this article. Coconut oil also helps to improve nutrient absorption. That means for your case, your nutrient absorption may have improved that helps to enhance your muscle build-up. And you should know that muscle is denser than fat. Weight gain is the possible outcome. Which is why some skinny people (severely underweight) after taking coconut oil for some time gain weight and become normal in their BMI. Another more likely reason for weight gain for your case is that calorie still counts no matter what you eat. Meaning, if you do not reduce your calorie intake and still stick to the same diet except for adding a tablespoon of coconut oil in the morning, then the overall calorie intake for that day could have exceeded what you're supposed to burn, and any excess unused energy is converted to body fat. For example, all along your daily intake is 1500 kcal and you burn 1500 kcal through workout. That evens out. Now, you add a tablespoon of coconut oil (126 kcal) to your diet in the hope of burning more stored fat. That makes your total intake of calorie become 1626 kcal. Okay, coconut oil increases metabolism, right? But different people react differently. If your metabolism only raises a bit, say to the point where it'll burn off 1550 kcal, after simple calculation (1626 – 1550), you're left with the unused 76 kcal. Where will it go to then? Your fat store, of course. Result? You gain fat instead of losing. So, you need to cut down on your total daily calorie intake by (in this case) 150 kcal or more, or raise your workout's intensity level and you should see a good drop in your body fat over the next few weeks. Hello sir kindly tell me about consumption of coconut oil for weight loss , is it loss fat or weight ? Hi Muhammad, you'll lose weight first because coconut oil helps to detox (cleanse your colon of pounds of accumulated toxic waste) followed by fat loss when coconut oil burns off your body fat. Please read up on this entire article to get a better picture. I have been ingesting coconut oil, 1-2 tbs, throughout the day for 2 weeks. I intend to increase to 3 to 4tbs daily. I workout daily achieving 10,000+ steps a day, and eat a healthy low carb, low fat diet. The coconut oil has greatly improved my digestive system with only 2 days of detox symptoms initially. My concern is that I have noticed a 5 lb increase in my weight from 2 weeks ago. I had 20 lbs to lose and now 25lbs. What am I doing wrong? Hi Anna, please go to Why Coconut Oil Gains Weight which is simply my reply to Mihaela. Hi Anjali, of course you can do that. But I usually do not recommend doing so as coconut oil can induce diarrhea-like symptoms. Adding coconut oil to your diet makes it easier for your body to adjust itself to the detox effect of coconut oil. Myself pushpa I m taking 2 tspoon of virgin coconut oil with hot water in empty stomuch .. is it the right way for weight loss or need to take before meals? Hi Pushpa, did you get any diarrhea-like symptoms? If not, it's okay to consume it this way. But you need more for weight loss, so it's better to mix coconut oil with your meals rather than eating on empty stomach. Thank u sir, I m having hypothyrodism n taking homeopathic medicines . Want to loose weight especially tummy fat ,so shall I add coconut oil with my food ? Hi Pushpa, yes you should add coconut oil to each and every meal of yours, including beverages like smoothies, juices etc. You can add to soup as well. And to give your belly fat a stronger punch, exercise. My sister is having 9 month baby .. can she also take coconut oil for weight loss? Hi Pushpa, yes of course. But since she's going into labor soon, let her start off with one teaspoon (not tablespoon) per day first. If she takes one tablespoon instead, I'm afraid she might get the runs. This can cause some inconvenience for her. After she gives birth, then go into one tablespoon daily and gradually work up the intake from there. The key in taking coconut oil for weight loss is, you must be comfortable taking that amount. If not, reduce it. In your article "27 Tips to Get Healthy and Stay Healthy for Life", you talk and emphasize about eating breakfast. Can you explain how this contradicts the ketogenic diet and why people skip breakfast because of this diet for supposedly positive reasons and results? Hi Helen, as far as I know, ketogenic diet does not really encourage skipping breakfast. But it does promote intermittent fasting, not everyday fasting. And the fasting goes with the preference of the dieters, some prefer to skip breakfast while others, lunch. Breakfast is the easiest, in general. Skipping breakfast is meant to drive the body faster into ketosis where the body will start burning stored fat (there will be some muscle loss too). I don't advocate skipping breakfast for weight loss as metabolism is the ultimate key to losing weight effectively. But I do encourage people to sometimes fast in the morning to give their body a longer "resting time", provided you're feeling great doing the fasting, not feeling miserable till you almost tear your hair out that kind. Sometimes people might overeat at dinner, so the following morning they still have remnants of food inside their guts to keep them moving, and this is the best time to skip breakfast. I do it once in a blue moon when I tend to eat a little bit more the previous night. Bottom line, as long as it doesn't hurt your health, by all means. The information you shared is amazing. Look, I've taking virgin - coconut oil since January 10th. I went throught about 5 days of detox. I fell the energy increase and more benefits. However, what I want to solve is my overweight, just after the detox I started to walk, jogg, and weightlifting in a scafolded process. But, I'm feel like I'm getting stuck. After May 10, I have been taking it for 5 months. Moreover, honestly, I don not follow the amount of weight loss, but I noticed the resoults with my pants. I had some results but, now, I feel like getting up!. What should I do? or What am I doing wrong?. Because I have also changed my diet to healthier one, salads, fruits, among others. I hope you can give me some light!! Hi Manu, despair not. Calorie still counts, even when you take coconut oil for weight loss. Allow me to ask you. Your height and weight, please. And how many meals are you taking a day? May I know what you usually eat for your breakfast, lunch and dinner? I need more info from you to find out what actually goes wrong with your weight loss regimen. In the meantime, take a deep breath and keep a cool head and read over the information on this post again, plus all the comments. The reason for doing that is when you read something again with a clearer mind, you can easily spot some mistakes you've made. I have some queries to ask you for your wonderful advice regarding my weight loss. I am 10 kilos obese. I also have Hypothyroidism. Hence, my weight loss won't come down easily. I have started eating Extra Virgin Organic, Unrefined Coconut oil, 1 tbsp per day along with my breakfast meal, from last 5 or 6 days. My doubt is can I add 1 tsp or 1 tbsp along with my fruits salad also, or will the fruits taste queer with coconut oil on it? My second doubt is should I eat even the fruits salad to only 70% of stomach satiety, as I eat a big heaped bowl of fruits in place of dinner daily, and every time after eating it, my stomach feels extremely over-stuffed and over full and extremely bloated. So should I limit my daily fruits salad to a lesser quantity, in order to feel only 70% satiety of stomach? Thank you once again for your absolutely wonderful advice, I extremely appreciate your spending so much time and patience, in attending to each person's every single queries. Hi Sudha, the more coconut oil you take per day, the better it can help with increasing your metabolism, thereby improving your low thyroid problem. That said, you can of course mix virgin coconut oil with your fruit. Whether it will taste odd to you will depend on your palate. The reason why most people become overweight is because they eat too full at every meal. 70% is the best optimal satiety level for main meals. Rule of thumb: eat when hungry, stop when 70% full. But for snack, limit to 30–40% satiety. I have another important question to ask you, can I take MCT oil also along with my daily 1 tbsp of VCO for weight loss? Is there any health benefits from MCT oil also as from coconut oil? And will it truly help in weight loss? Hi Sudha, of course you can take MCT oil along with virgin coconut oil. MCT oil is a subset of coconut oil. Which means, they mix well together. The main health benefits of MCT oil is its faster conversion to energy. Because of that, you get to accelerate your metabolism faster. You need high metabolism to achieve weight loss. And so, yes, MCT oil does help to lose weight. I have some more doubts to ask you regarding my health, as I respect and value your opinion after reading most of your sites and your opinions and advice expressed in each of them. Especially I like your 27 tips on How To Get healthy and Stay Healthy. I eat a huge bowl of varied fruits daily in place of dinner at around 7:30 or 8:00 P.M. I am pre-diabetic, so is it safe for me to eat so much fruits daily? And I am 10 kilos obese also. I always feel stomach over-bloated and over-full feeling after eating this huge bowl of fruits and this bloated and over-full feeling lasts for at least more than one hour. Plus I get more flatulence problem also after eating so many fruits. Also, I take at least 4 teaspoons of Raw, unrefined honey daily, is this okay also? The Raw honey is one tsp for my early morning lukewarm, lime water, then the 2nd tsp for one glass of Fenugreek liquid,(as I read it helps in bringing down blood glucose levels in pre-diabetics, those who are not on diabetic medicines), 3rd tsp for one glass of Chamomile tea, or one glass of milk tea, 4th tsp for my 2nd glass of Fenugreek liquid which I drink at evening again. Is it okay to take in so much of raw honey along with the huge bowl of fruits salad daily, with my obesity and pre-diabetes conditions? And is it okay for me to skip a solid dinner meal and substitute it with the big, over-heaped bowl of fruits salad on a daily basis? Thank you very much for your much appreciated opinions and advice. Hi Sudha, you need more fiber to help stabilize your blood glucose levels. Though fruits have fiber, they come along with high-calorie sugar too. So, mix your fruits well with more vegetables. Vegetables are good for weight loss because they make you feel full easily but are low in calories. Chew well to help slow your eating speed. Eating fast is one of the reasons for introducing air into stomach, causing flatulence. Of course, indigestion of too much food causes that too. You should cut down on your honey intake since you're pre-diabetic. Start off by reducing 1 teaspoon to 1/2 teaspoon for each of your intake. This way you'll be taking 2 teaspoons per day instead of 4. Whether you take a solid dinner or bowl of fruits, keep your satiety level down to 70%, as mentioned in your other comment. Thank you Sir, for all your esteemed advice. I will follow as much of your advice as possible. I have been using nirmal pure cococnut oil with lemon water on empty stomach,instead of VCo.Will it help me for weight loss. Hi Sirisha, as long as it's coconut oil, it should help you achieve weight loss. However, it does not effect weight loss when you only take a teaspoon of coconut oil or two a day and you're expecting to see some significant changes. At least 3 tablespoons of coconut oil per day, I would say. Cut back on meat and other high-calorie food, and compensate the reduction of these foods with coconut oil. That's how you lose weight with coconut oil. So i should take atlst 3 tblspon of coconut oil daily and its okay if it is not VCO also na.It doesnt lead to weight gain na if it is not VCO.And is it okay if i take it with lemon water morning and evg. Hi Sirisha, the components of virgin coconut oil and regular coconut oil are almost the same. The only differences are their quality and fragrance. Whether you gain weight or lose weight will depend on your overall diet and total daily intake of calorie. By taking more coconut oil, you should be taking less of other junk food such as meat and high-sugar stuff. And that's where coconut oil starts to help you lose weight. As long as your consumption of coconut oil with lemon water doesn't upset your stomach, you're good to go. And please read over the article on this page once again. You'll get a clearer picture of how coconut oil helps with weight loss. I started using coconut oil after I shower along with those suction cups that supposedly help with cellulite. After a couple months, people kept asking me how much weight I'd lost. I never checked. But, obviously it is absorbed through the skin. I didn't intentionally change my diet, but may have been eating less.